The one thing that needs to be now remembered in our evolving dealings with China is that the country is now operated by political elites trained in the west and imbued with our ideas and responsive to what has worked in the past for us. They are naturally allergic to ideology considering the joys of Communism. We on the other hand still tolerate and even sometimes elect political ideologues who are eager to denigrate the successes of their opponents in order to advance oft times incredible folly. Recently these fools have attempted to downgrade the Reagan revolution in tax management in order to replace it with a terrible leftist agenda. It is as if they think we can support social programs by strangling the countries income. That our own leadership will turn over success is appalling. What the credit crisis of 2008 proved is that the USA cannot be trusted to properly manage a global reserve currency. This was already obvious, but the crash ripped it apart. It is now necessary to unwind the role of the US dollar as the primary reserve. The cost will be borne to some degree by all, but the US in particular will be experiencing a new set of rules. Expect the Chinese to attempt to create a better system. Let us wish them good fortune. The globe cannot tolerate another round of fast credit expansion as the last one in which available credit out stripped the supply of creditworthy customers. Credit granting must be a conservative modestly profitable business. Add a point of profit and you accept ten additional points of risk. This is risk that cannot be escaped with mathematical modeling or even luck. It also takes an extraordinary mindset to preserve capital in the face of success. You can appreciate my dismay when the investment banking crowd got loose in the banking industry a decade ago. History shows it cannot work and my own personal experience in the securities industry showed the same result. You can rest assured that the young Turks made sure the old hands were kept out of the credit kitchen. Yet that is always the way. The challenge now is to see if it can be made to work a lot better. China began the long journey to a new international reserve currency with a single step - agreeing to buy $50 billion in notes from the International Monetary Fund. Another proverb, less distinguished than a quote from Daoist philosopher Laozi, also applies here: China put its money where its mouth is. After calling for a super-sovereign reserve currency to replace dependence on any national currency, China’s leaders have made a concrete commitment toward achieving that far-in-the-future goal. The IMF announced Wednesday that China had signed an agreement to buy $50 billion in notes denominated in Special Drawing Rights, the IMF synthetic asset which China favors as an alternative to the dollar as the world’s reserve currency. It’s the first such agreement in the history of the IMF. The news didn’t come as a surprise, as China’s intention had been announced in June. It didn’t have a noticeable impact on markets because immediate foreign-exchange-rate effects are negligible. Nevertheless, the formal signing of China’s agreement with the IMF is a significant development, albeit at the long-term policy level. “The IMF’s relevance has returned in light of the financial crisis and this transaction represents a new way forward for the IMF to obtain funding,” wrote Gareth Berry, a currency strategist at UBS in London, in an email note. Moreover, the purchase of IMF notes gives China the opportunity to increase its influence within the IMF, where it still holds disproportionately small voting power, Berry noted. With Russia and Brazil on tap to buy similar IMF notes to the tune of $10 billion each, that gives the IMF about a quarter of the $283 billion it needs for SDR reserves. Early this week, the IMF said it had allocated $250 billion and another $33 billion would be added on Sept. 9. 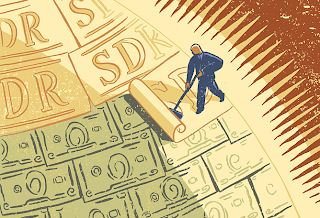 This will increase the outstanding stock of SDRs to the equivalent of $317 billion. If the IMF were a country, it would have the fifth largest foreign-exchange reserves in the world, lagging slightly behind Taiwan but ahead of India. So in one fell swoop, China has accomplished several things. It has shown that it’s serious with its push for reform of the international financial system. It has given SDRs more prominence than ever before. At the same time, it has found a safe parking place for a tiny part of its more than $2 trillion in reserves, one that doesn’t depend directly on the dollar or U.S. government debt. Perhaps most importantly, China has demonstrated yet again it has considerable clout at the loftiest levels and isn’t afraid to use it in a constructive fashion. It’s backing its rhetoric with $50 billion in action.